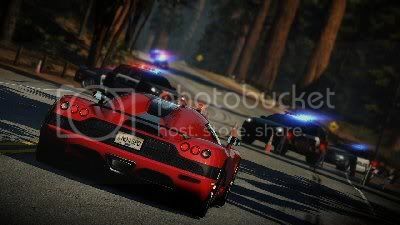 by PaulEMoz in "Chase HQ", "Criterion", "Need for Speed Hot Pursuit", "cops", "racing"
Oh man, this is awesome. I'm saying that only an hour in, so I suppose it could all go wrong... but I can't imagine how. I definitely need some speed now... I'm last! I think, in the main, that Need for Speed has a need for cops. They add an extra dimension to the racing that lifts it above the average. I was really happy to hear they were going back down that route, but apprehensive... could they get it right? Then I heard that Criterion were on the case, and I relaxed a little. Criterion are awesome. 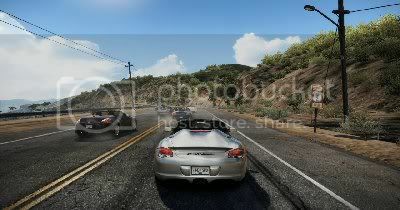 And after an hour, I can say that Need for Speed: Hot Pursuit is awesome. It's exactly what I'd hoped for from a Hot Pursuit game, with lots more thrown in because Criterion loves us. It's got aggressive cops - they're going to give you a hard time. And that's a Good Thing. It would be no fun if they chased you and then just milled around politely, hoping you might pull over. No, they'll ram you hard and aim to damage you as much as possible. Bring it on. It's got decent and aggressive AI opponents. Even from the first race, you're not going to just pass everybody on the first straight and roar off into the distance. This game has opponents that want to win. Again - bring it on. It's got shortcuts - proper, long offroad shortcuts like Hot Pursuit 2, and plenty of them. This is important. The shortcuts not only give you ways to get the jump on your opponents, but also provide ways around police roadblocks. The shortcuts were an integral part of Hot Pursuit 2... I'm glad to see them used properly in this game. It looks lovely, and it feels great. Being a racer is as great as you'd hope (and they've given you limited weaponry in some races now, too), and being a cop feels, in some events, as much like a modern-day Chase HQ as you're ever likely to get. The only thing(s) it seems to be missing are the huge jumps... I haven't done any yet. I'm not missing them enough to matter. This is huge fun, and pretty much a dream arcade racer for me. This is after two hours... I broke off from writing this to go back to the game. And now I'm going back to it again. This isn't a review, just my initial impression... there's loads of game to play yet. Loads of lovely game. It's absolutely clear to me that at least a few of the chaps at Criterion must have played and loved Hot Pursuit 2 at least as much as I did. They get what it is that made that such a great game and have taken all that and put it into this game, whilst adding the best of Burnout and their fantastic knowledge of the online system. Cheers, gang, I can't get enough of this game..